You'll find interviews and some really great music along with our cast of contributors who have some things to say. You'll enjoy Cliff Bellamy and "Cliff Notes", "Where you at Chip" with Chip Shearin" plus there is the update on policy from State Representative Larry Hall. We love adding some poetry from our girl Val Jones and TCs' insight of the sports of the week. We may even have some give always for you in the way of tickets to a awesome show. 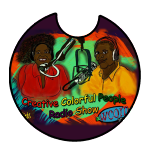 Tell a friend to join us for Creative Colorful People radio, It's about the art, the artists and the art of living well.